Export unlimited contacts stored in excel spreadsheet to MS Outlook profile efficiently without loss of any data with the help of XLS to Outlook Converter tool. It allows importing complete contacts details from excel sheet. The details may contain the fields such as first name, last, email address, phone number, address and other details. The proper mapping of excel contacts must be performed before the conversion of excel contacts to Outlook. This software facilitates to correctly map the fields of excel sheet so that it remains in the same fashion after completion of the import process. For example, the first will map with the first contact of Outlook. 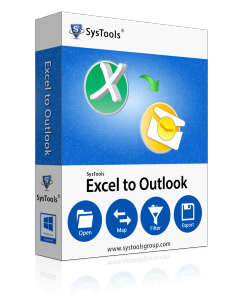 The XLS to Outlook Converter software provides the option to remove the duplicate contacts from the excel file. It is also possible to include duplicate contacts while conversion from excel to outlook pst. If the excel file contains the empty email fields then xls to Outlook tool provides the option to remove or exclude such fields before the final conversion. It provides the flexibility to include or excludes to such contacts having empty email addresses. If you do not want to save the contacts in the normal list. The tool provides the facility to create the distribution list of it. XLS to Outlook automatically creates the distribution list from the contacts contained in the excel file. It also facilitates to give user defined naming to the created distribution list. Demo version of Excel Spreadsheet to Outlook PST tool allows Converting and saving first 5 Contacts free of cost. Does the software support import email addresses from excel to outlook distribution list in batch? Yes, you can import multiple excel sheets to Outlook distribution list. Is there any facility to directly map the contacts contained in Excel file to Outlook 2016? Yes, XLS File to Outlook tool provides the mapping facility to directly map contacts to Outlook. Do I need to install Outlook on my machine to successfully import email addresses from excel to outlook 2010? Yes, Outlook must be installed and configured on the machine to successfully import email addresses from excel to outlook 2010. Can I install the software on my Windows 10 operating system? Yes, You can install software on Windows 10 and its below version also. I have tried the multiple application to import contacts from excel to outlook but none of them gives satisfactory results. Then, luckily I got to know about your tool. Genuinely, I had successfully export contacts from csv file to Outlook. The pricing of the software was affordable as compared to other software of the same category listed online. Thanks for the help. I was glad to use such nice software for the conversion of excel file to Outlook. I was amazed and stunned quite to saw the performance of the XLS to Outlook Tool. Especially the mapping option is out of the box feature of the software. The support helped me out to install the software on latest Windows 10 OS. At last, Thanks for such nice software. Map Excel fields with Outlook attributes.